The Fat Quarter Shop has released another video with a FREE pattern perfect for those adorable charm packs we all collect (usually with no idea what to do with them! lol). They asked me to do my own version of the quilt “Charm Pack Cherry” and I happily agreed. I used the lovely new line Hello Petal by Aneela Hoey and a lovely Bella Gray solid for my quilt. There are lots of charming moments in this quilt. The pattern is simple but satisfying, perfect for a beginner. I enjoyed combining fabrics for the quilt with the charm packs on the front, left over charms for the back along with a gorgeous AMH linen and finally a Joel Dewberry fabric for binding. Once again the fabrics spoke to me and I listened. I intended to use the AMH linen for a skirt for myself but that doesn’t seem to be happening any time soon. So when I spotted it (on the floor, woops!) across the room, I was delighted to see how perfectly it combined all the colors of Aneela’s line from the front. And I knew I wanted to bind this with something strong given that there was so much grey on the front of the quilt. I found the perfect choice once again in my stash with an older Joel Dewberry print (from Modern Meadow, my favorite all time line of his!) It has the whimsy in it that matches Aneela’s line once again and the navy was perfect matched. The front came together perfectly with the four charm packs, two solid and two print. The directions were easy to follow. Though I will say that I was making great effort at keeping the prints directional and found later when I was assembling the top that all that work went out the window. In the end it didn’t matter in the slightest and I would encourage anyone to throw caution to the wind and let those prints go every which way. I know. I know. Type A’s like me are struggling with that. But trust me…it all works out beautifully. The back was a test of making use of those final left over charms from the charm packs. I knew right away I wanted to make use of the new Accuquilt Die for equilateral triangles which I found was perfect for Charms. Yay for easy cutting and perfect points! You may have noticed already in the pictures but I also tried a, new to me, free motion quilting pattern of large flowers. I was totally stepping out of my comfort zone here, but you’ve got to keep pushing your own skills. I won’t ever get better if I don’t try! I think that it turned out fairly well for a first time with this technique and I would definitely do it again…I know that I have room to grow still. But here was a pretty moment. Oh and I’m giving props to myself to using a bright coral thread that would show EVERYTHING, good and bad. Another comfort zone growing moment. I didn’t cop out with a grey thread that will disappear. 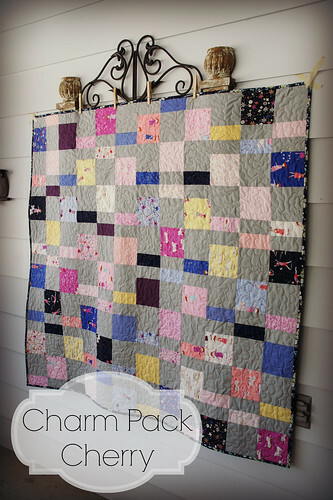 Go check out Kimberly from the Fat Quarter Shop walking you through this pattern. Run over to the video they’ve prepared! And look at all those other fun versions of the quilt there are! 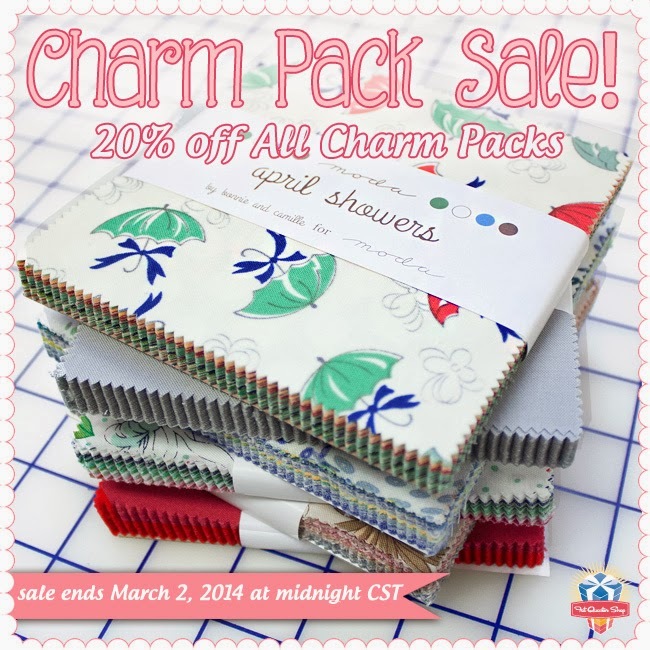 To help celebrate the new pattern, The Fat Quarter Shop has all charm packs 20% off for the next week only! There are some adorable new lines out, so hop on over and get started on this quick project. 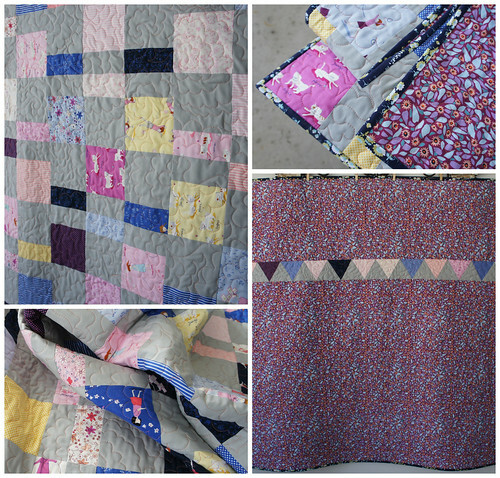 Your quilt is beautiful, I love Aneela Hoey her designs are divine…also you did a fantastic job on the quilting, absolutely love it. I love that so many people used something other than white as their solid! The grey looks great! 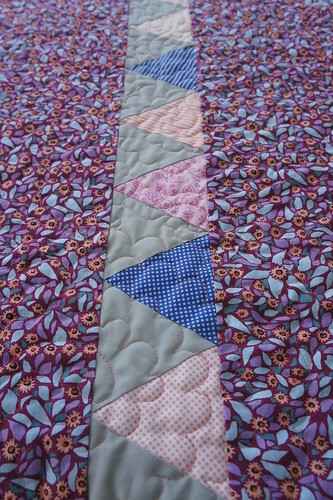 The FMQ looks great and I love the colour of thread you used. It looks great. I collect charm packs and I don't even Quilt!!! What's that about? You did a great job – I wouldn't have said that grey would have worked, but it absolutely does! xCathy. (p.s. Giveaway at mine if interested).